Feijoa has its very own font! It is designed by Kris Sowersby at the Klim Type Foundary (a New Zealander of course). I just adore the softness of the font and the flamboyance of the ligatures, which remind me of the delicate stamens of the feijoa flower. Feijoa is my first serious book typeface, representing four summer’s worth of bloody hard work. I wanted a feeling of softness in a typeface, to design a type that didn’t have all the sharp points and edges that can make digital type so stale and inhuman. The saying “a straight line is a dead line” was very inspirational, I initially took that rather seriously. However, it became apparent that this need not be taken literally, as many of the baseline curves became irrelevant at smaller sizes. There really isn’t much more for me to say. All I wanted to do was make a decent, useable text typeface that could handle most uses in book settings. I never really read these blurbs anyway–most typophiles just look at the letterforms and make up their mind! Because I know very little about typography (except that I want this one for a tattoo, an artwork wiggling around in my head and a t-shirt design for my child), here are some links to Klim’s own site, an interview with him and industry reviews of his creative brilliance. I love the thought of this: cake and crumble. This recipe comes from Taste magazine, May 2009. Line a 23cm cake tin with baking paper. Preheat oven to 180°C. To make topping, blend flour, sugar and mixed spice in a bowl, squishing any lumps. Pour over melted butter, mix in with a fork, then stir in almonds. Set aside. For cake, melt butter gently, then leave to cool. Grate zest from lemons and set aside. Peel and mash banana. Halve feijoas, scoop out flesh and mash. Mix mashed fruit with 1 tablespoon lemon juice. Sift flour with a pinch of salt and the baking powder. Use an electric beater to whisk eggs in a large bowl until blended, then slowly beat in sugar. Continue beating until light and foamy and the mixture leaves a thick trail off the upheld beaters (this may take up to 5 minutes). Sprinkle lemon zest over. Sift half the dry ingredients over egg mix and fold in lightly with a large spoon. Pour cooled butter arond the sides of the bowl. Fold together gently until just amalgamated. Sieve and fold in the rest of the dry ingredients, then fold in fruit. Pour into tin. Gently scatter over crumble topping, trying not to deflate cake batter. Bake for 30-40 minutes or until cake is springy to touch, golden and pulling away from sides of tin. Remove from oven and rest for 15 minutes. Invert onto a plate, cover with a cake rack and turn it right side up again. Leave to cool completely. Dust with icing sugar before serving. Julie Biuso is one of my favourite food writers and cooks. I have several well-marked copies of her Italian and Mediterranean recipe books and love them end to end. Put the sugar, water and wine into a saucepan. Set the pan over a low heat and dissolve the sugar, stirring occasionally. Either slice the feijoas in half and scoop out the flesh or peel and cut lengthwise (looks more effective). Add the fruit to the sweetened wine in the pan and bring to the boil. Lower the heat and cook gently for 5 minutes. Transfer the feijoas to a bowl using a slotted spoon, then gently boil the liquid in the pan until it is reduced and syrupy (this takes about 15-20 minutes). Pour syrup over the fruit, then set aside. Serve the feijoas at room temperature with lightly whipped cream or plain, unsweetened yoghurt. This more traditional feijoa chutney is from the New Zealand Woman’s Weekly, a trusty cooking companion for generations of Kiwi cooks. It looks easy enough to double or triple depending on the amount of feijoas you have to hand. Place all ingredients in a large heavy-based saucepan. Bring to the boil, stirring until sugar has dissolved. Turn down heat and simmer hard for 30 to 45 minutes, stirring regularly until thick and syrupy. Ladle mixture into sterilised jars. Be sure they are well sealed. Store in a cool, dark place. I’ve started a hunt for recipes that have real winter feel to them and stumbled across this one from Alexa Johnston, a New Zealand author and home cook. Her heartwarming website Ladies, A Plate (oh, doesn’t that phrase bring back the childhood memories?) has a collection of fabulous recipes that are steeped in the comforts of traditional home baking. Alexa explains that this recipe for roasted feijoa chutney is based on a recipe by Peter Gordon which she has adapted. The chutney is slow roasted in the oven, rather than cooked on the stove top. All her recipes are tried and true and available in her beautiful published books. I know this is going to be a favourite. She warns that this is a very large recipe which uses up to a dozen jars so you may want to make it in smaller batches. 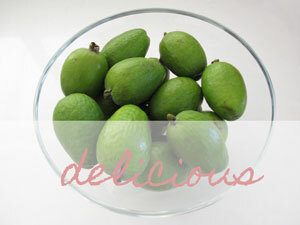 Put the unpeeled feijoas through the mincer, or whiz them in batches in the food processor. You don’t want a complete puree, just a lumpy sludge. Do the same with the red onions and the whole lemons. (It’s a good idea to cut the lemons into quarters and flick out any pips first.) If you like a lumpier texture, you could just chop everything fairly finely with a knife, and I sometimes do that with a few of the feijoas and one lemon. Put it into clean jars, seal and leave for at least a week before eating. This allows the flavours to mellow a little. It will keep for at least a year in a cool, dark place. Makes about 6 pints / 4 litres of chutney.